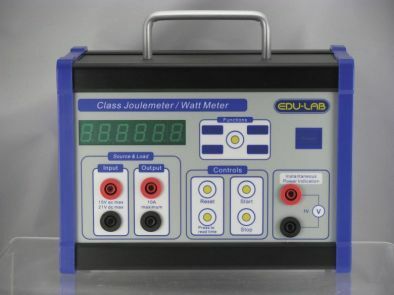 The Edu-Lab Joulemeter/Wattmeter is light, compact, and designed for class demonstration or student use. The unit can measure energy taken up by a load, either by AC power or DC power, and from 1J to 999,999J or 1mJ to 999,999mJ and can also measure power level of 200mW to 200W. One pair of 4mm sockets is also provided to indicate the instantaneous power. Depending on mW / mJ or W / J range, 1V full scale deflection represents 100mW or 100W respectively. Design: single chip microprocessor with dedicated precision analogue multiplier for power measurement. Accuracy: 5%, typically better than 3% at full scale.